Our new webinar series helps you make the most of the new VisionLink technology and manage your fleet like never before. Hawthorne Cat, the exclusive Cat® equipment dealer in San Diego, the Hawaiian Islands and the Pacific Region, announces a new series of webinar training courses for the VisionLink platform. 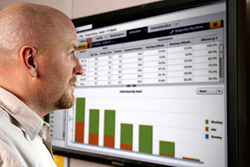 VisionLink technology helps optimize fleet management by providing a collective view of all your machine data. It tracks the location of machines and assets, plans and schedules maintenance, and reduces idle time. The streamlined system includes customizable dashboards and alerts that allow operators to make more well-informed and timely decisions. The new webinar series is a unique instructional opportunity offered by Caterpillar through Hawthorne Cat. It includes 5 courses: Unified Fleet Overview, Mixed Fleet, Tips & Tricks for Maintenance Managers, Mining the Data for Site Managers, and Cat Inspect. Registration is free for all webinar sessions. Visit the Hawthorne Cat website to register for upcoming webinars and view the full course schedule. Contact your Hawthorne Cat EMSolutions Representative at emsolutions(at)hawthornecat(dot)com or 800.437.4228 for more information.